For more than half a century, The Group for the Advancement of Psychiatry (GAP) has produced position statements on relevant and controversial psychiatric topics. 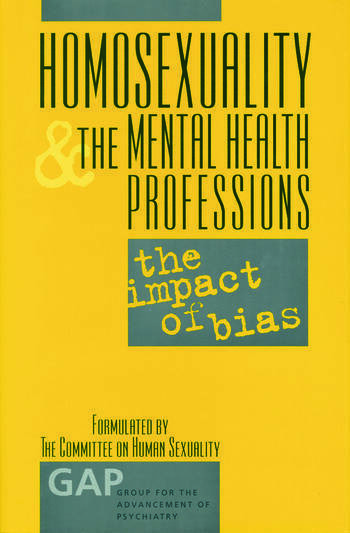 This latest monograph, Homosexuality and the Mental Health Professions: The Impact of Bias,continues a tradition of timely publications dealing with specific aspects of bias, discrimination, and human sexuality. This monograph acutely identifies problems of bias, overt and covert, as they affect the treatment of lesbian and gay patients and as they influence the training of mental health professionals. Incorporating clinical vignettes that detail actual incidents from a wide range of clinical and professional encounters, the report enables the clinician not only to review his or her own experience, but also to envision alternative possibilities of constructive and caring intervention. As psychiatry enters a new era of understanding the full range of normal variation in human sexuality, this monograph will serve both as an indispensable teaching tool and as an invaluable touchstone for assessing quality of care with gay and lesbian patients. Dimensions of Antihomosexual Bias. AHB in the Clinical Setting. The Impact of AHB on Supervision and Professional Training. Legal Aspects of Antihomosexual Bias and Mental Health. HIV and AHB in Mental Health. Homosexuality and the Mental Health Professions: The Impact of Bias is a collaborative work from the Group for the Advancement of Psychiatry, Committee on Human Sexuality.